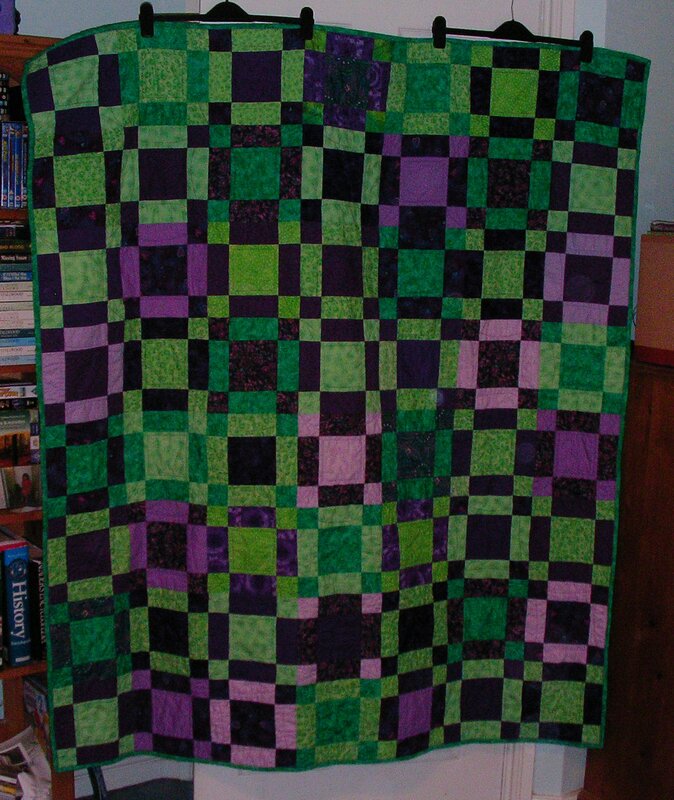 Easter 2011: A new quilt for my father-in-law. 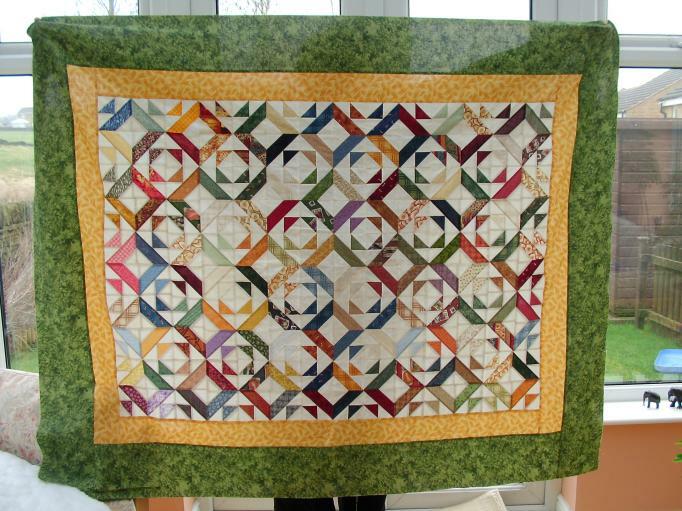 This is from the “Freeze Frame” pattern designed by Judy Laquidara. 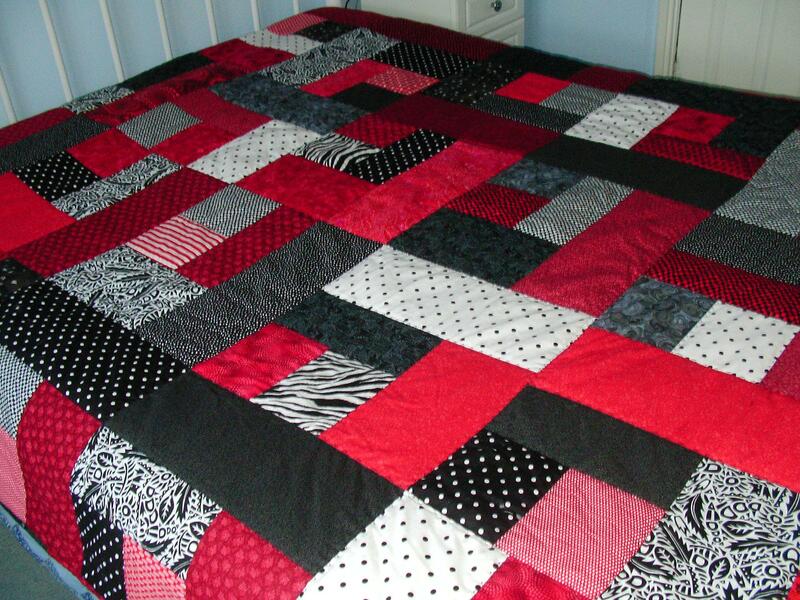 This was my first time to do free-motion quilting on a large project. 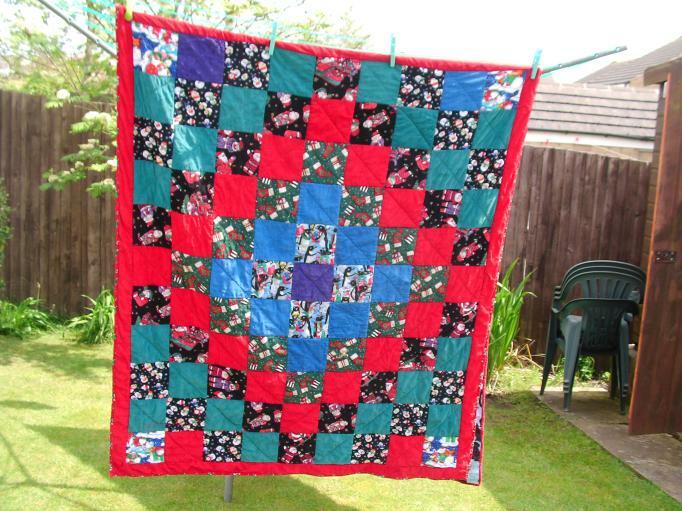 February 2011: A doll quilt made for a colour challenge on another quilter’s blog. 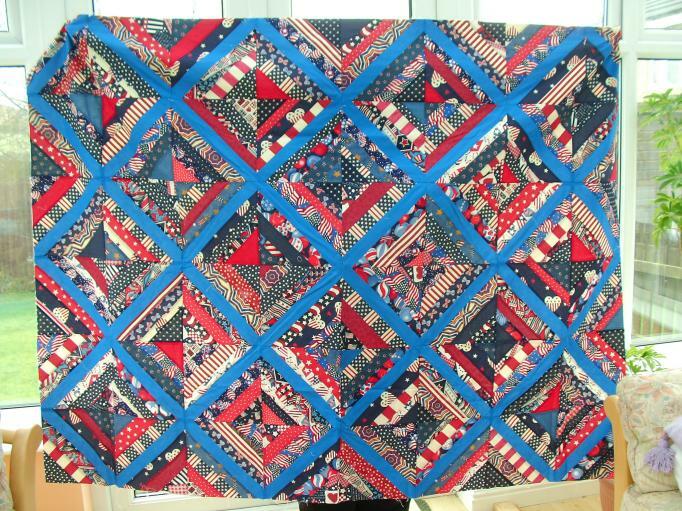 The pattern is Civil War Doll Quilt and was designed by Kathleen Tracy. 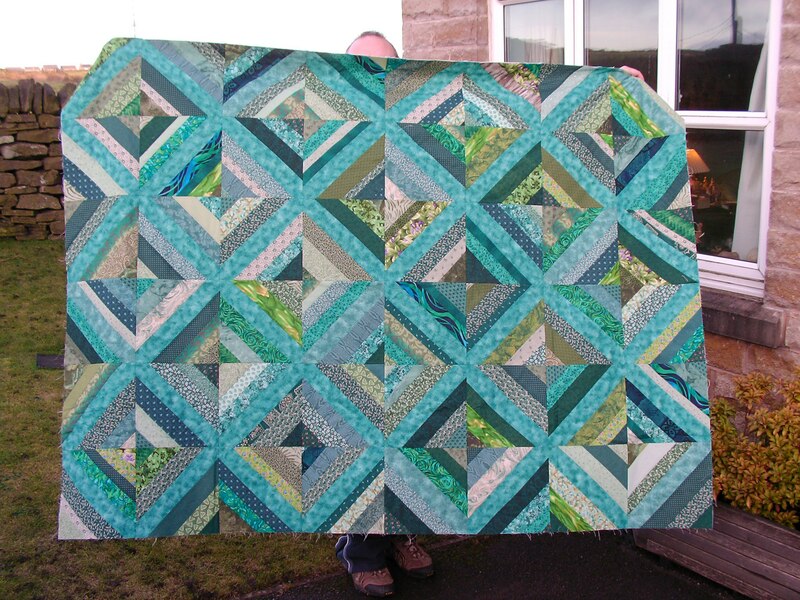 December 2010: Green string quilt. October 2009: This is a snuggly quiltlet for my younger daughter from a pattern by M’Liss Rae Hawley called “Woven Ribbons” from her book, Fat Quarter Quilts. 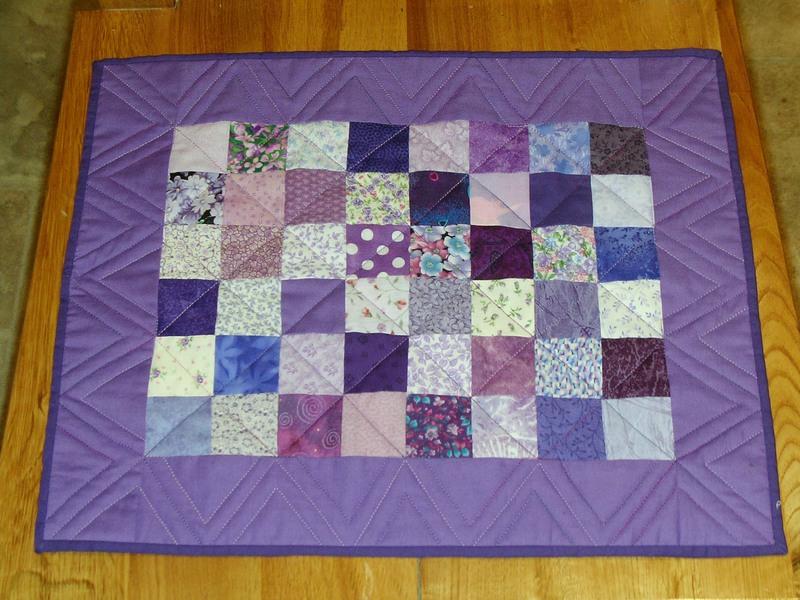 The pattern was for a baby quilt, and I changed the borders and enlarged it to make it suitable for an older child. 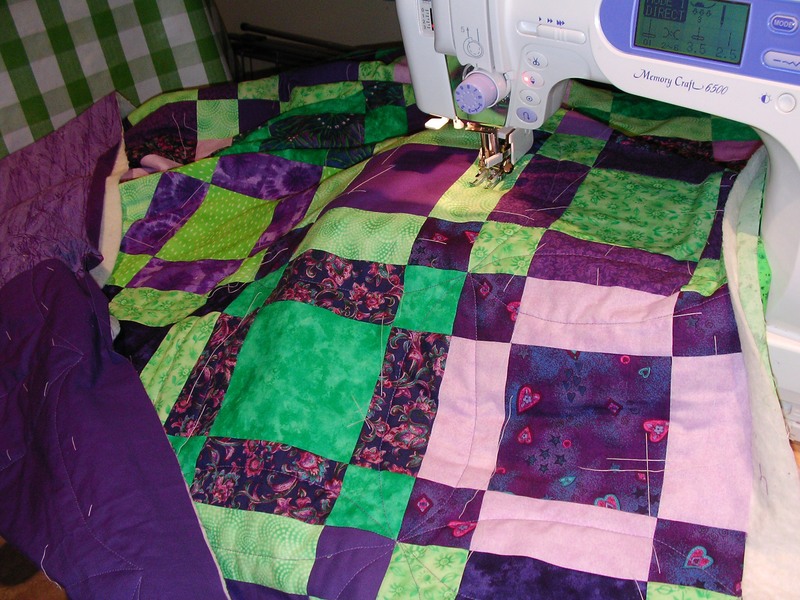 The quiltlet is just two layers — I top-stitched the quilt top to a bright green fleece throw and bound the edges. 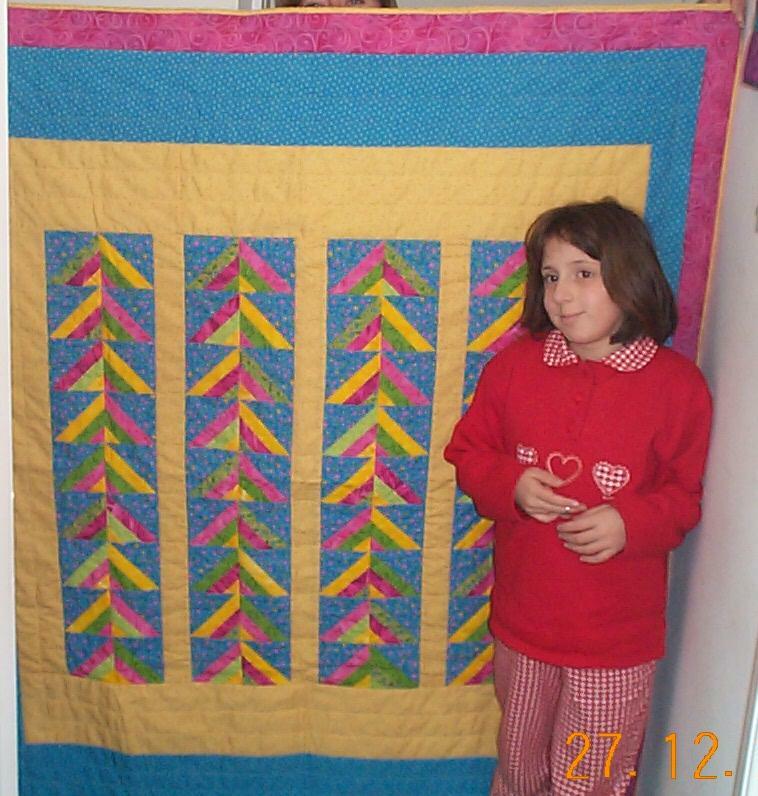 “I Spy Birthday Quilt.” I started this quilt in 2006 and finished it in 2008 in time for my little daughter’s birthday. 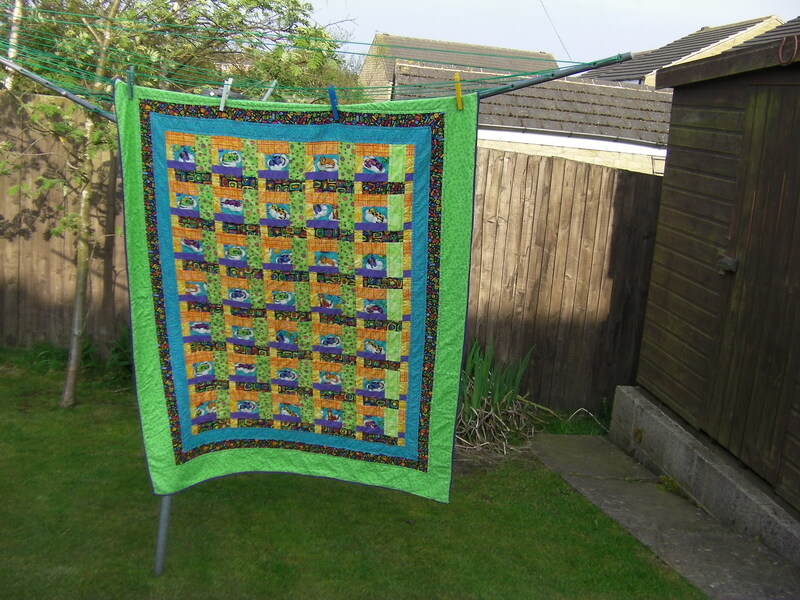 The pattern was inspired by a quilt that I saw in an Australian quilting magazine bought in 2005 while on a holiday in Norfolk, England. 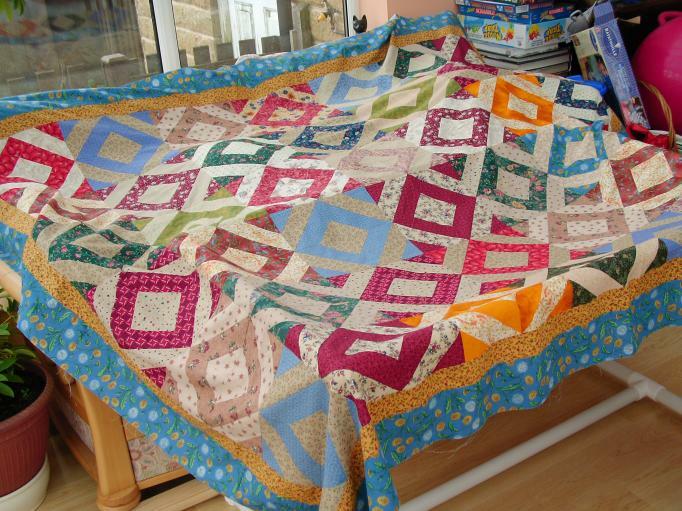 I carried that magazine around with me for over a year while I collected my fabrics to make the quilt. 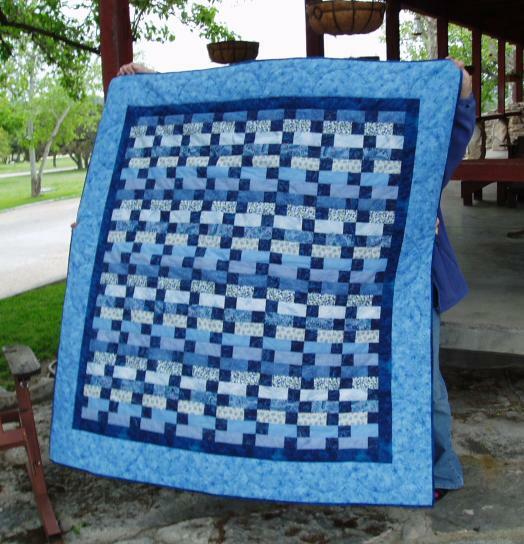 This quilt is called “Bridging the Gap.” It was a gift in 2004 for my childhood friend, Blue Eyes and Bluebonnets, who searched the world for me and found me again after we were all grown up. We have both gone far away from our little Texas hometown. 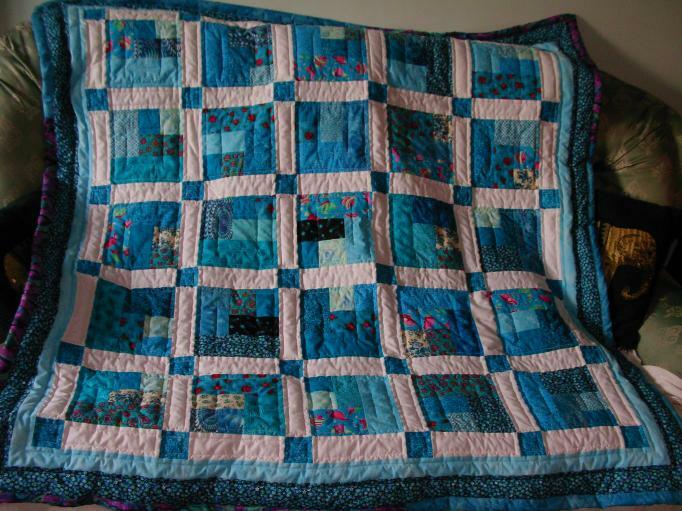 The pattern is “Broken Bricks,” designed by M’Liss Rae Hawley, from her wonderful book, Fat Quarter Quilts. 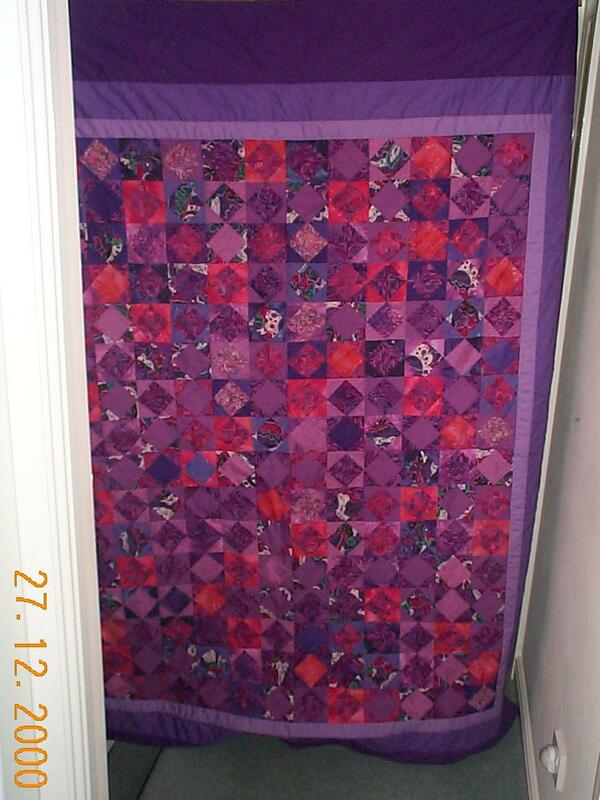 “Purple is Our Happy Colour.” The first large quilt I ever finished (2000). It has puckery borders and wavy edges, but my niece loves it and still has it on her bed more than 8 years later. I didn’t know anything about artistic quilt photography back then; I just wanted a photo to remember the quilt by. 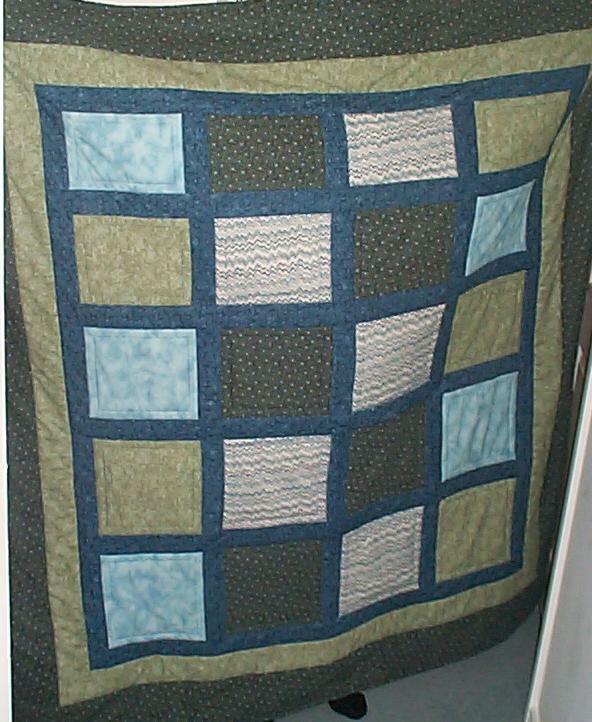 A lap quilt for my father-in-law’s TV chair, made about 2001, I think. 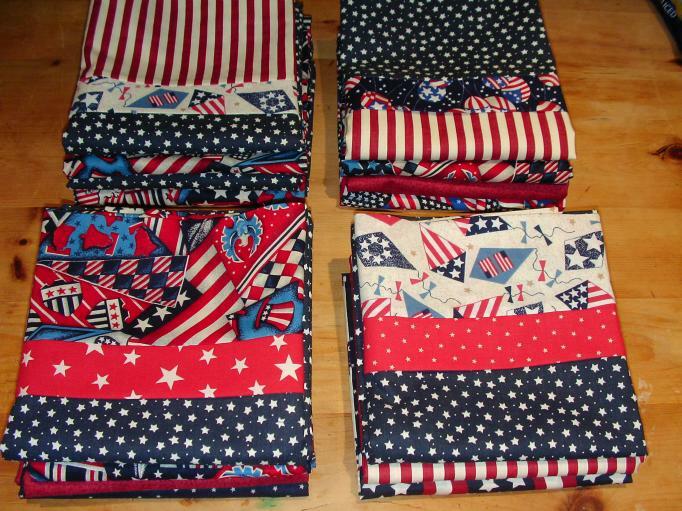 Two quilt tops, March 2009, and 15 pillowcases, November 2008, for the USA Quilts of Valor group, made as part of the HeartStrings Quilt Project. 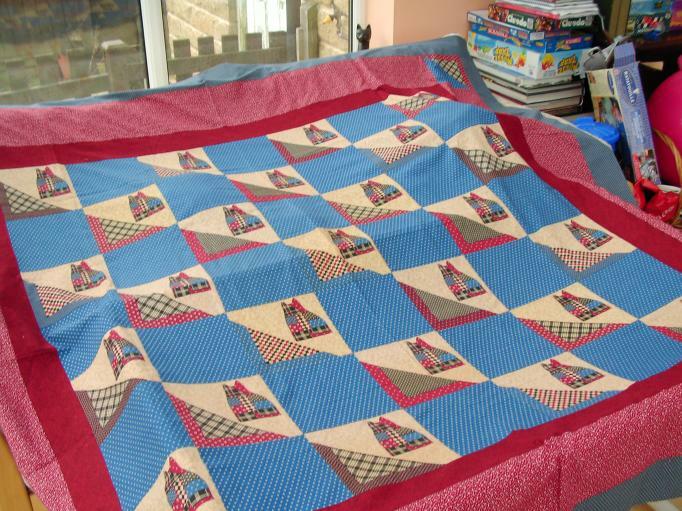 “Harvest Festival” and “Country Squares,” two quilts made for the Quilts of Valor-UK project, March 2009. 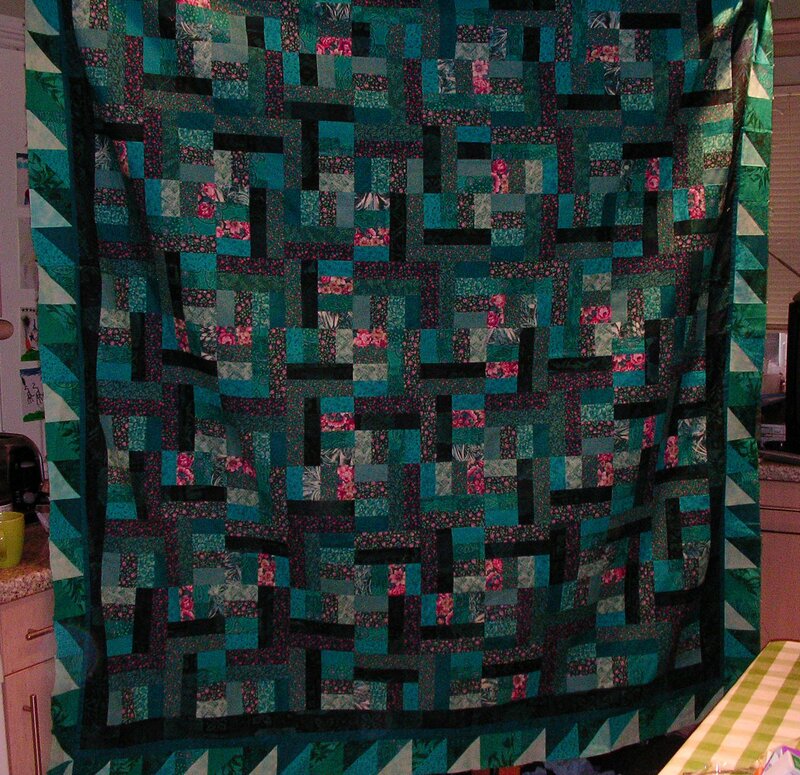 A queen-size bed quilt made for my older daughter’s Christmas 2008 present. 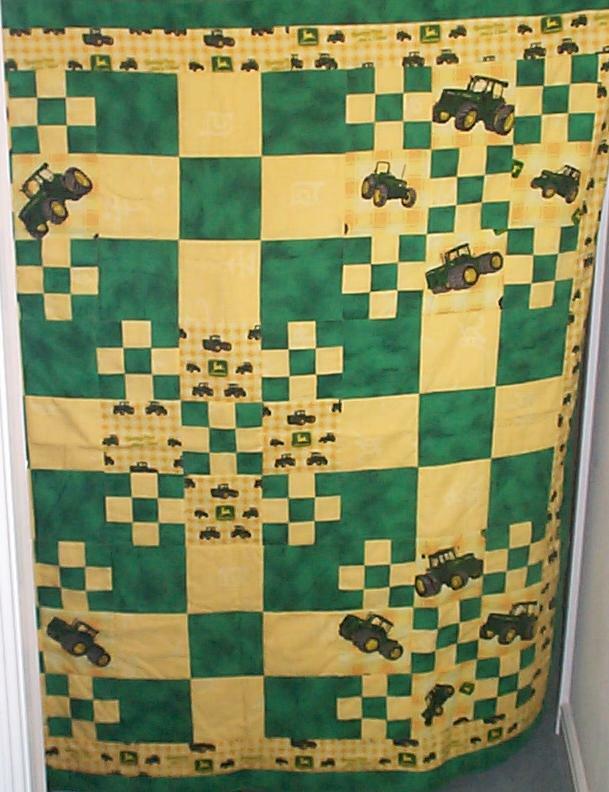 John Deere 9-Patch, made for my young nephew in 2000. When he was a little boy, he wanted to be a farmer. I bought this fabric on a holiday in America. Rainbow Geese, made for my little niece’s Christmas present in 2000. 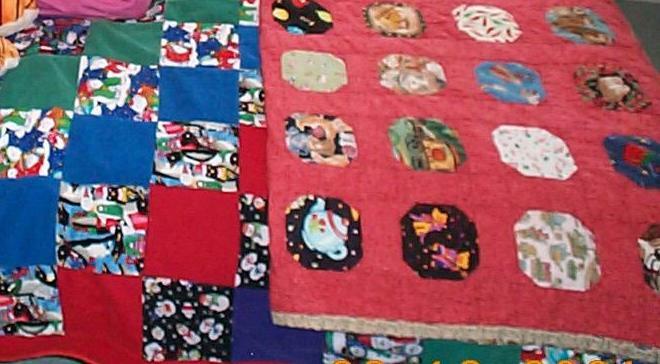 Early quilts for my older daughter: “I Spy” snowball quilt, 1998, and corduroy Christmas quilt, 2000. The solid green corduroy came from a Laura Ashley dress that I bought in a thrift shop for 50 pence. It was in perfect condition — a very lucky find! 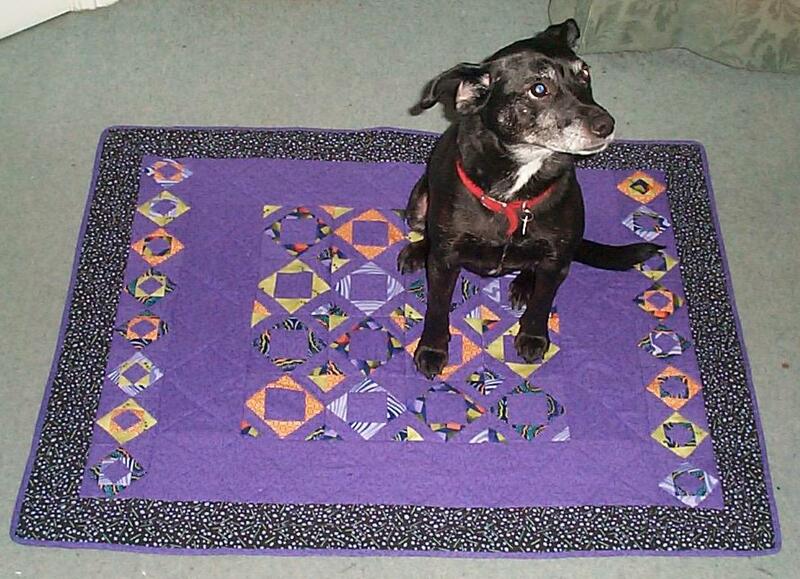 A second corduroy quilt made for my younger daughter in 2006, using the left over fabric from the first one. So lovely and great looking models. The last one is lovely. Look how we in Finland make these. You are a quilter after my own scrappy heart. 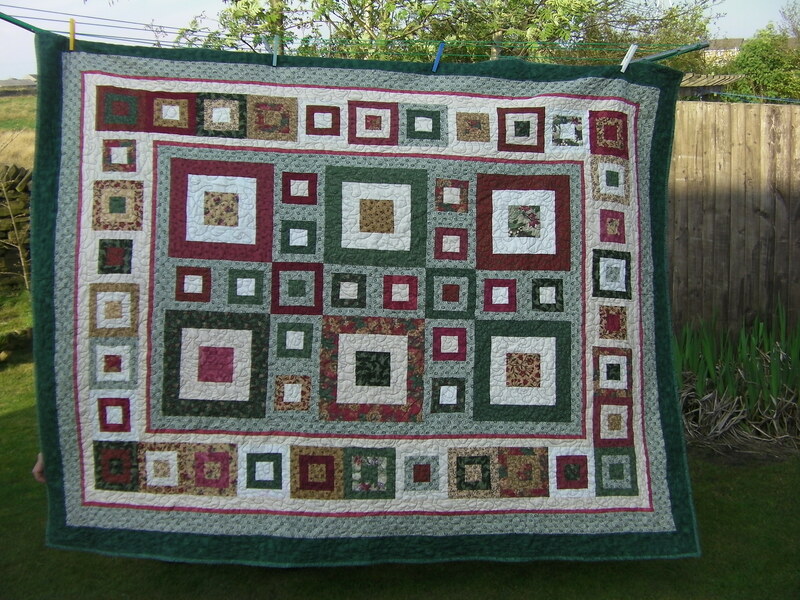 Your QOV-UK quiltsare awesome, Dianne. No photo of the “Bears in the Farmhouse” we made? I really liked your colors on that one. All of them are lovely. My favorite is qov-usa1.